THIS CAT IS BEING FOSTERED IN WALNUT CREEK. PLEASE READ HER FULL BIO FOR MORE DETAILS, I BET ALL YOUR QUESTIONS WILL BE ANSWERED! TO ADOPT: FILL OUT ADOPTION APPLICATION AT TCRESCUE.COM/ADOPT Mini is ~7 years young and is a shorthaired Dilute Calico who we rescued from a cat sanctuary that burned down in the Camp Fire. Mini loves to stand on her back feet, and she is completely litterbox trained. 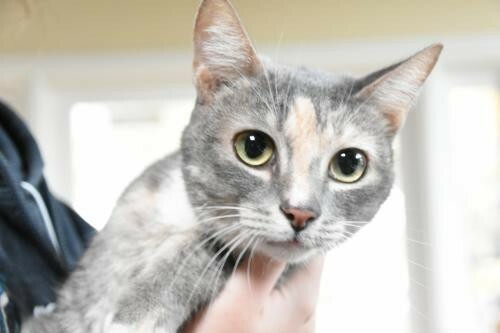 Mini loves to talk to her humans, and she is super friendly and affectionate. She would love to be adopted with her sister Ginger, they are like two peas in a pod! And they have been companions for so long that they would be sad if they were separated at this point in time. Read about the benefits of adopting cats in pairs here: www.tcrescue.com/why2cats Mini is being fostered in Walnut Creek. Her adoption fee is $50. She is spayed and vaccinated. Adoption fee will be discounted to $25 for seniors, or if she is adopted with her sister, Ginger. If you would like to meet this kitten, please start by filling out our adoption application at: tcrescue.com/adopt ADOPTION INQUIRIES SUBMITTED WITHOUT A COMPLETED APPLICATION FROM THE LINK ABOVE MAY NOT RECEIVE A RESPONSE. Can't adopt? Consider sponsoring! Tax deductible donations (tax ID 46-1473579) can be made through the Paypal "Donate" button on our website: tcrescue.com Tailchaser Rescue is a 501(c)3 non-profit, no-kill organization dedicated to rescuing cats and dogs from shelters where they are in danger. Our foster volunteers provide loving temporary homes for our rescued animals until they are adopted. By adopting a cat or dog, you're making a commitment to provide love, care, and medical treatment for the life of the animal, which can be up to 20 years or more! We are committed to placing our rescued animals with families who are prepared for the responsibility of owning an animal for its entire lifetime, so that they are never again at the mercy of the shelter system.